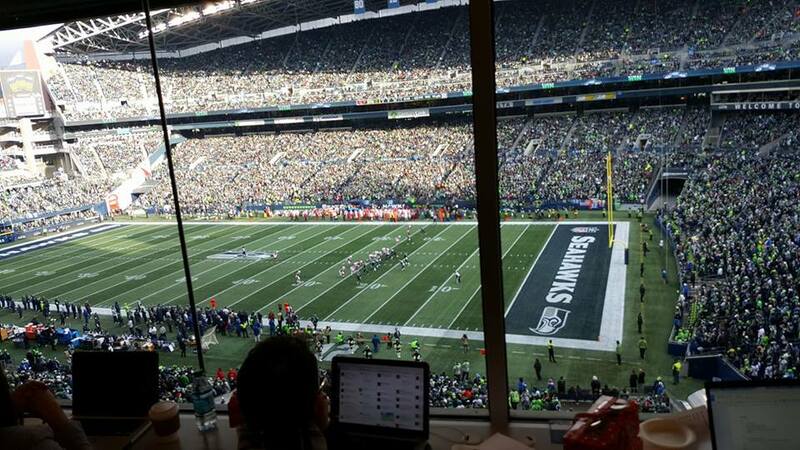 It felt exhilarating to be at Century Link Field in downtown Seattle on Christmas Eve. I was up high in the press box with a birds-eye view of the players, surrounded by roughly 70,000 blue, white and green fans who are known for their ability to cause tiny earthquakes in support of their team. I was there to write about The Paul G. Allen Foundation and the Seattle Seahawks teaming up to support Cocoon House, a local non-profit serving at-risk and homeless youth and their families in Snohomish County. Through the month of December, every dollar donated to Cocoon House will be matched by Paul Allen. It is estimated that 35,000 kids and teens are homeless around Washington State. 34% of homeless people in Washington state are under 24 years old. Data suggests that homeless kids are five times more likely to become homeless as adults. 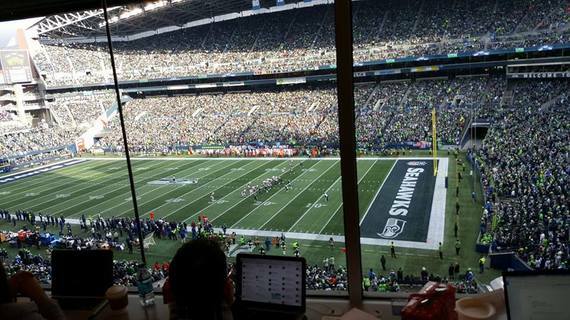 The fundraising efforts were going strong on Christmas Eve at the Seahawks vs. the Arizona Cardinals. I had a chance to speak with Julio Cortes, Public Relations Manager for Cocoon House about what it's been like working with Paul Allen and The Seattle Seahawks. "Paul Allen and The Seattle Seahawks partnership has been a game changer for Cocoon House because out of every dollar raised seventy-seven cents goes directly into getting youth off the street and into warm beds and hot meals. Also they have been amazing at spreading the word and raising awareness on an issue that lies in the shadow." At the beginning of the game four teen success stories from Cocoon House were on the field talking about their experiences with the program. I asked Cortes what it was like for the teens sharing their stories. "They loved meeting some of the players and were really blown away that someone as popular and well off as Paul Allen would care about them and what they are going through." Cocoon House is breaking the cycle of homelessness by offering emergency and permanent housing for teens, but also community outreach that meets the teens where they are, as well as offering support for at risk youth and their families in an effort to keep the kids in the home as a first step. If you look at the statistical cycle of homelessness, you can see how powerful this donation and social media campaign can be toward breaking that cycle today for these kids and their future by focusing on root causes and long term solutions. As I sat there watching the game I realized this would be my fourth story on the homelessness crisis in Seattle--my first piece was published in July where I criticized the mayor and suggested he find a mentor. I wasn't trying to disrespectful, my inner homeless childhood self, she's around eight, a bit of a scrapper, with dirty blond hair, freckles and a belief that in spite of being let down by most adults, the world is a good place. I am proud to be scrappy like her because she's obviously a part of who I am. I see her sleeping alongside her sister in a car. In the morning their single mother will drive their "home" to a local McDonald's to hurriedly brush their teeth and wash their faces (they have to do it fast so they won't be caught be employees) in the public restroom and then off to school. Where we would pretend everything was normal. 35,000 kids need our help. Which is why this fundraising campaign is so important...how different my childhood could have been if I had never been homeless? I recognize I have a bias against the mayor and members of the city council...but I'd have a bias against anyone who had the power to change peoples lives and instead choose to endlessly talk with little action. Since the state of emergency was declared by the mayor over a year ago we have 19% more tents, makeshift encampments, people lying on sidewalks in sleeping bags spooning as if they were in an outpost on Mt. Everest, literally tons of garbage, hopelessness, and nothing seems to change, except the rhetoric. The City of Seattle website has a link called Pathways Home, a campaign launched last month which represents the city's new plan to tackle homelessness. The new plan reminds me of a New Year's resolution with a few bits of accountability, "For too long, too much of the debate, energy and resources in this city have been focused on emergency, short-term emergency interventions. Pathways Home is our plan shift the focus to longer-term solutions." Scroll down a bit and it's back to junk food. Out of 50 million allocated in 2015, 70% of all those tax payer dollars is still going to emergency shelters and services when their own research shows that this doesn't solve homelessness. I did a test run the day after Christmas. I called the numbers the city had on their website if I needed emergency shelter. I was referred to the crisis line. There were 75 beds available on a first come first serve basis in a space at the city. You couldn't call, you had to show up at 7PM and pray you got a bed. The other option was a place for women and children, I called the number repeatedly and received a busy signal each time. "Inertia," Paul Allen said once during an interview when he was speaking about new platforms in technology and how to stay competitive, "is very prevalent. New platforms that come down the pike, really internalize that, you have to catch up...strategy wise, any time you're challenged by or coming behind a platform you have to meet the capability and have some things that are persuasive to have them switch." Ultimately, in order to overcome people's inertia you have to come up with something better, meet the capabilities and beat with a shorter development cycle, your best people, agility and focus." This is good advice from a tech billionaire about business technology but also for the crew down at City Hall regarding how to solve the homeless crisis in Seattle. If the vastness of homelessness is overwhelming but you want to do something before the end of the year to be a part of the solution, donate to Cocoon House text TEAM to 91999.